MFC's Fixed Filter Plate cloth media filter systems feature stationary media plate technology, which reduces equipment maintenance, mechanical complexity, and overall installed cost. Systems have NO internal or submerged moving parts. MFC's Cloth Media Filters feature the industry's first fixed cloth media filter plate design for the treatment of municipal and industrial wastewater. 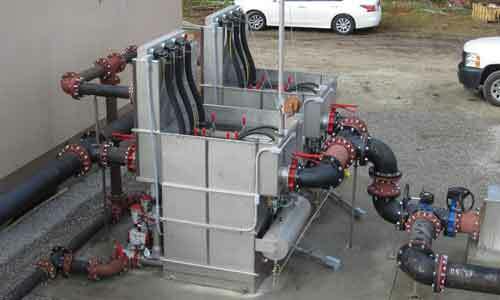 These innovative cloth media filters utilize unique hydraulics and the latest cloth filter media technology to eliminate pumps, drive motors, chain gears, high-pressure spray bars,backwash & sludge manifolds, and other mechanical wear items, resulting in a uniquely simple, effective cloth media tertiary treatment system. MFC Cloth Filter Systems use a combination of differential head and a series of simple open-close pneumatic valves to provide wastewater filtration & backwash flow control. Vertically placed cloth media panels reduce equipment footprint and installation expense. MFC's systems offer proven performance in a wide range of flows and applications. Packaged systems are available from 10gpm to 3.0 MGD and include 100% stainless steel tankage and media elements for long life and reduced maintenance. Modular systems are also available for retrofit into new or existing concrete tanks. Please visit www.fluidynecorp.com for equipment details and pricing. Download the latest brochure or visit Fluidyne Corporation for details & pricing. Or visit Jacopa for details & pricing in the UK and Europe. All information contained herein is property of Municipal Filtration Co., LLC (MFC). Patents Apply. All rights reserved.